This year I wanted to hang a wreath on the front door that I could leave up all winter. I wanted to enjoy my wreath for at least a couple months and when using a Christmas type decoration that isn’t possible. 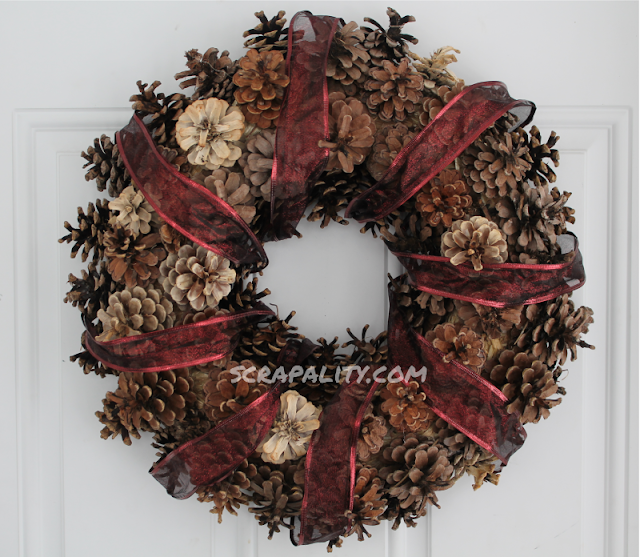 The pine cone wreath is simple to make using basic supplies. To create my wreath, I gathered pine cones from a nearby tree and stored them inside. Storing the pine cones inside allows them to open up fully. Most of my pine cones were completely closed up when I gathered them. 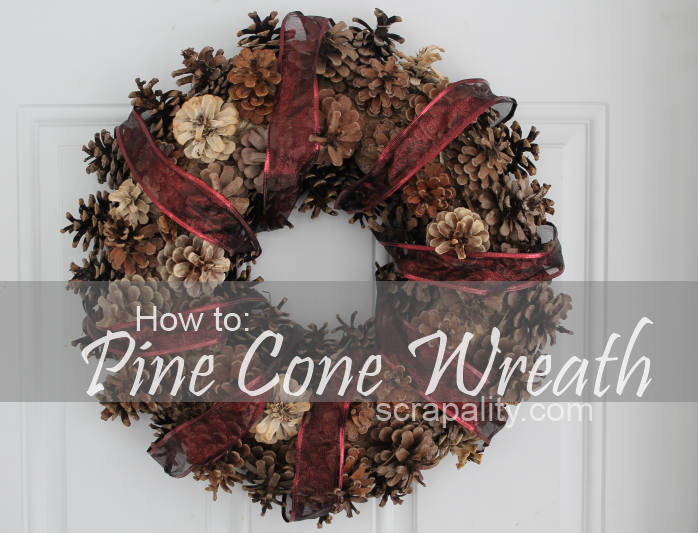 Before adding the pine cones tie a piece of jute or twin around the form to create a way to hang your wreath. It’s easier to do this now then wait till the pine cones are in place. I started the covering the form by hot gluing pine cones inside the center of the ring. Don’t be shy when adding glue. I used 8 glue sticks for this project. Add additional pine cones around the form till the entire front is filled. Squeeze small pine cones or broken pine cones in between the full pine cones to hide the form from showing. When you’re happy with the placement of the pine cones, hot glue one end of the ribbon to the back of the wreath and gently wrap the ribbon around the wreath. Once you’ve finished wrapping the ribbon hot glue the end of the ribbon to the back of the wreath. Hang the wreath on the door using the piece of jute or twine. Stop back for a Christmas tour of my holiday creations. Thanks for stopping by and Happy Holidays! I love the fact that this can be used for Christmas but left up all winter as well! Thanks for visiting Night Owl Corner….just stopping by to check out your blog too! Here’s wishing you and yours a New Year that is filled with Love…Compassion…Health…Joy….Faith…Friends…Family…Charity…Humanity…Insight…Happiness…Insight…Peace and Inner Peace! Also we wish you all that is good in the world because YOU are special! HAPPY NEW YEAR!!!!!!!!!!!!!!!!!!!!!!!!!!!!!! !